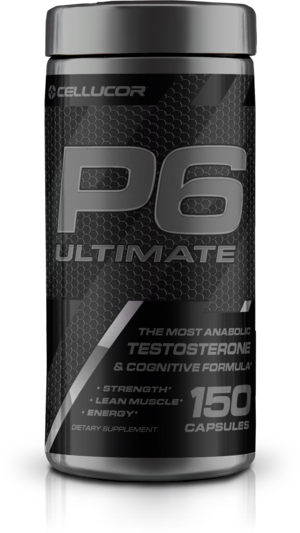 From Cellucor’s newest line of products comes the P6 Ultimate, the brand’s long running testosterone boosting supplement. The new addition to the P6 family doesn’t necessarily focus on more test boosting ingredients, but looks to be a more complete supplement with pump and focus enhancing capabilities. As you can see, the label mentions two non-transparent blends (companies still do that? ), the first being the testosterone part of the label and the second being the pump and focus part. Since the blends are non-transparent, we can’t really judge its effectiveness, but we’ll break it down for you anyway. 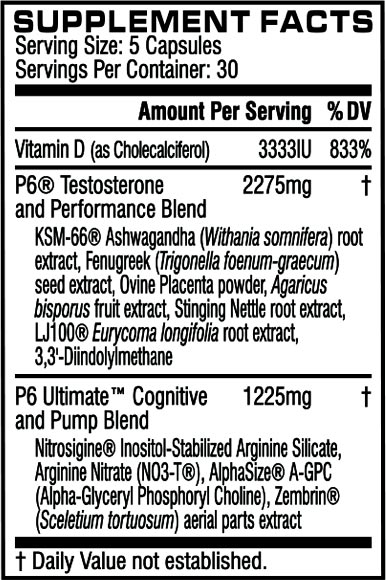 P6 Testosterone and Performance Blend – This blend includes many ingredients from older P6 products, with a 2275mg blend of KSM-66 Ashwagandha, Fenugreek, Ovine Placenta Powder, Agaricus Bisporus, Stinging Nettle, LJ100 Longjack, and DIM (3,3 Diindolylmethane). From an ingredients standpoint, this blend looks to be very promising, with the likes of Ashwagandha, Fenugreek and DAA being proven to raise testosterone levels and Longjack which reduces cortisol and helps with sexual health. P6 Ultimate Cognitive and Pump Blend – For the pump and focus blend we have a 1.225g blend which includes Nitrosigine Inositol Arginine Silicate and NO3-T arginine nitrate for all your pump needs, and AlphaSize alpha-GPC and Zembrin, which are two mental boosting ingredients, with Zembrin being a really unique and effective cognitive function enhancer. The Label’s Bottom Line- Although we don’t have the exact doses for each ingredient, we see that the blends actually look like they would get the job done. The P6 Ultimate uses first grade ingredients and the combination of the bunch seems to have made a well-thought and complete product. We got our hands on some pre-release product and took it for a ride. Effectiveness – The P6 Ultimate’s dosing is simple, You take 5 pills on an empty stomach. We recommend taking the pills in the morning, since the Zembrin may interfere with your sleep if taken late. And since you can’t see results with a test booster in one day, we went for the whole 30 servings in the bottle. After a month of using the P6 Ultimate, and the results were showing. You actually feel stronger, the weight goes up and body fat decreases. The boost in focus is also there, but nothing too big. Unfortunately, this is the department where the P6 Ultimate will lose most of its interest. Launching for a WHOPPING $159.99 for a 30 serving is, well, outrageous. Even in previous P6 outrageous standards. Obviously you can always compare prices and see if we’ve hunted down any deals on the P6. While at it, be sure to sign up to our supplement deal alerts as we continue to hunt the best deals from your favorite stores. Yes, the price is eye popping. Yes, the label uses non-transparent blends. But disregarding those facts, the P6 Ultimate does it’s job very effectively and fans of these products would want to get their hands on it (assuming they drive a Porsche…).